Boa constrictor amarali are one of the very unique subspecies of Boa constrictor. Between their short tails, broad-flat heads, and thick bodies these are morphologically different than any other Boa subspecies. Selectively bred Boa constrictor amarali often exhibit aberrant patterns, with broken saddles or striped dorsal pattern. Others have extremely peaked dorsal patterns (saddles) or reduced saddles to the point where they appear as dotted markings. 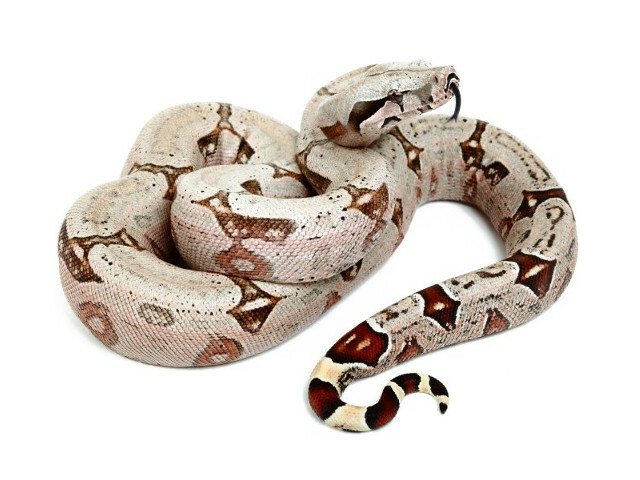 The background color of these boas can range from pastel, to very dark grey in appearance. I house all my adult female Boa constrictor amarali in 1.2 x 0.6 x 0.6 meters (4 x 2 x 2 feet) terrariums. Obviously anything bigger is also acceptable as long as you can provide the necessary heat and humidity level. Juvenile Boa constrictor amarali are housed in appropriate sized tubs and moved into bigger tubs as they mature. Adult males will do fine in a 0.9 x 0.6 x 0.6 meters (3 x 2 x 2 feet) terrarium. I wouldn’t even bother with decorations inside the terrarium as they will be trampled and knocked over/pulled off walls. I provide all my snakes with the option of a hide box. Some use it, others don’t. It’s always better to give the snake an option. I don’t use anything fancy, a simple large cat litter tray turned upside down with a large hole drilled in the top suffices for my adult females and males. Smaller sized plastic boxes can be used for smaller/juvenile snakes. I do try to keep the boxes black or grey though, as this will help them feel secure. One at the hot end and one at the cool end will let the snakes choose what suits them best. I personally use Aspen or Orchid bark. Substrate should be deep enough for the snake to burrow in. Aspen seems to work well and it gives the snake something to burrow and get a good grip on. This helps with security and muscle growth. Aspen also soaks up the urates and turds nicely!!! It’s recommended to incorporate UV light. It brings out the colours perfectly on snakes. Just remember to give them a hide to escape the bright light if they wish to do so. A timer can also be incorporated to be on however many hours you please throughout the day (I would recommend 8-12 hours on, 12 hours off during none breeding season). They must be given a night cycle. I use underfloor heating for all my snakes. I keep the heat mats at anywhere between 31-33°C (88-92°F). Heat mats of an appropriate wattage will do just fine if your room doesn’t drop below 16°C (60°F) throughout the year. Obviously a thermostat is needed to control the heat output. I heat the ambient air temp in my snake room (during winter only, I am based in the UK) to around 20-22°C (68-72°F). Fresh water should always be available. I try to change the water 3 times weekly, twice at the minimum. It is also recommended to clean the water bowls with an appropriate reptile disinfectant once a week. I just use normal (UK) tap water. Nothing fancy. Bolivians seem to thrive in either humid and not so humid environments. I have an automatic fogging system that comes on 4 times in 24 hours to keep up the humidity in my snake room. They seem to love it. Watch those fingers!!! Boa constrictor amarali are the heaviest bodied of the constrictor family, and it’s easy to overfeed them. ALL of my snakes are fed once, then I wait until they defecate before I feed them again. This could be 2 weeks or 4 weeks apart. Overfeeding will lead to an obese snake that won’t fair well in the long run. The days of power feeding should be well and truly over. Juvenile Boa constrictor amarali can be hissy and strikey due to their small defensive size. They usually grow out of it by 1 year of age. Adults seem very calm (but inquisitive, perhaps the most inquisitive of all the constrictor family). Try to support the body and neck with two hands due to their size and weight. This should be common sense, but never trust any snake. They are after all, wild animals with lots of pointy teeth. I have been struck at by an adult female whilst taking photos for no reason whatsoever. No warning signs, no ‘S’ing of the neck. Just BOOM out of nowhere. This is obviously not the rule and hopefully a one off. But always pay them the respect they deserve. All urine and turds are removed within 24 hours and spot cleaned with F11 or similar. The whole enclosure should be thoroughly cleaned out at least 3-4 times a year. If the humidity is right you should have no problems at all. Health issues tend to be rare, but some of the most common include mite infestation, respiratory infection (generally due to incorrect temperatures, humidity levels) & other bacterial & viral infections. If you have any concerns about the health of your Boa constrictor amarali consult a vet without delay.